On the face of it, Trump’s erratic behavior with allies and his violation of the 2015 accord on Iran’s civilian nuclear enrichment program ought to give North Korea pause about negotiating with him. The Iran deal in particular was closely negotiated over the course of years. Iran gave up 90% of its nuclear enrichment program in return for an end to economic sanctions. While the other member states of the UN Security Council did lift UNSC sanctions, the Republican-controlled Congress not only did not lift unilateral US sanctions but actually slapped more on. And then along came Trump, who violated the treaty entirely. Since the US economy is a fourth of the world GDP, likely Trump can use the Treasury Department to destroy what is left of the Iran deal by imposing heavy fines on firms that deal with Iran. Trump agreed to the G7 memo and then after he left, he reneged and insulted Canadian premier Justin Trudeau, and then Trump’s henchmen came out to smear the Canadian leader. So if the US proved so feckless with regard to Iran and the G7, why should N. Korea now trust any deal Trump makes? The answer is that N. Korea doesn’t trust Trump at all and is not planning to make any deal with him to give up its nuclear weapons entirely. Kim Jong Un wants the prestige that would come from a two-way summit with the world’s sole superpower. Even if the talks go nowhere, Pyongyang will have seen a permanent rise in its world standing. N. Korea has a more authoritarian government than Iran by orders of magnitude. Although Iran’s parliamentary and presidential elections are not fully free, inasmuch as the regime vets candidates for ideological adherence to the values of the 1979 Islamic Revolution, the polls are otherwise relatively aboveboard and can produce surprises when the public swings toward a dark horse and away from the Establishment candidate. No element of Kim Jong Un’s government has to face an electorate. He does not have any constituents that he needs to please. Thus, while Trump’s destruction of the Iran deal deeply harms the government of President Hassan Rouhani, Kim Jong Un might actually be strengthened by an open act of American perfidy. N. Korea can afford to play with fire in a way that Iran could not. 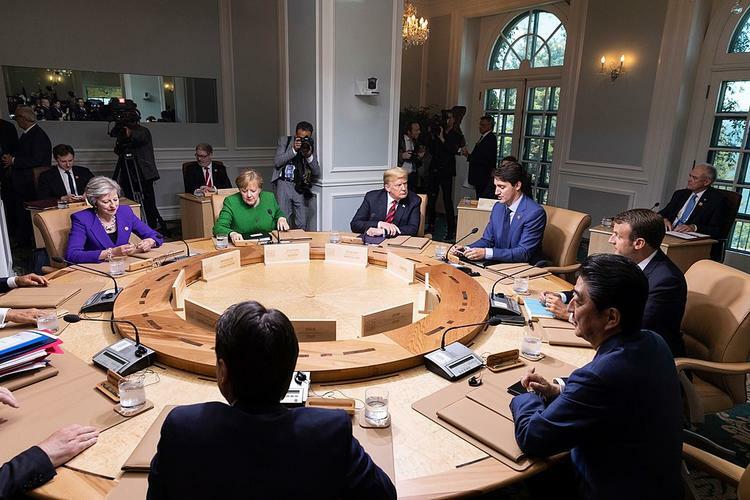 Featured Photo: A working group session at the G7 summit.